SINN FÉIN President Gerry Adams MP MLA and the Party’s US representative and General Secretary Rita O’Hare, were in the USA last week for a hectic 72 hours of public engagements and fundraising. Gerry Adams arrived in New York on Tuesday afternoon for a packed evening event in Rory Dolan’s in Yonkers. The next evening he spoke at the annual Friends of Sinn Féin fundraiser in the Sheraton Hotel on 7th avenue. Around a thousand people packed into the ballroom to support the Friends of Sinn Féin organisation. The following day Adams and O’Hare flew across to the west coast for an event on Thursday evening in San Francisco. When they arrived in the California city the local Friends of Sinn Féin committee took the Sinn Féin party in to Gaelic Park, a new 13.5 acres sporting facility just built on the site on a US Naval Base on Treasure Island in San Francisco Bay. The two fields that have been constructed entirely through voluntary labour, will be dedicated on 7 December with a tournament of All Star football stars and five days later President Mary McAleese will arrive to officially open the facilities. 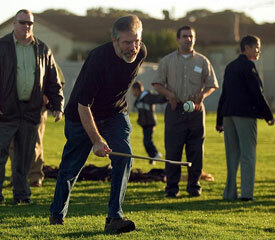 Adams took the opportunity to pick up a hurl and join with some of the locals in hitting a sliotar about the field. Later that evening the Sinn Féin President spoke at a fundraising event in central San Francisco before leaving for home on the Friday.